Abram Wakeman was “affable, insinuating and pleasant, though not profound not reliable,” observed Navy Secretary Gideon Welles.1 Welles, a strong critic of New York politics, did not approval of President Lincoln’s shift in New York patronage in September 1864: “The removal of Andrews as Naval Officer, the appointment of Wakeman to his place, causing Wakeman to leave the post-office, into which they have thrust Kelly, an old fiddler for Seward in other years, is a Weed operation.”2 Wakeman’s political background was limited. 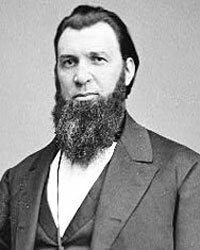 He had served only a single term in the New York State Assembly in the early 1850s and a single term in Congress (1855-1857). His real claim to political power was his association with Republican leaders Thurlow Weed and Henry J. Raymond. This was passed by the Fremont men and all others opposed to Mr. Lincoln, and was with difficulty prevented[.] It resulted, however, not only in their not passing any such resolution, but I succeeded in inducing the Committees to sign an autograph letter addressed to the President, pledging him their continued support &c &c.
Wakeman closed the letter: “I learn Mrs. L. is to be in New York the first of the week Pray present my compliments to her and say if I can serve her in any way I should be most happy — By the way, I may say we have inaugurated a movement which will harmonize the New York conflicting organizations”.7 A few weeks later, Wakeman was appointed Surveyor of the Port of New York. Wakeman had wanted to be named Collector of Customs, but Republican moderates and leading businessmen in New York favored Simeon Draper for the post. Businessman Moses H. Grinnell wrote the President opposing Wakeman’s appointment, saying “He holds a good Office, our party has fallen to a mere cypher, while he has held the position of representing the Administration and certainly nothing can warrant one man holding two prominent offices.”8Wakeman’s position as Postmaster may have worked to his disadvantage in another way. During the July 1863 draft riots, his home in Yorkville was burned to the ground. Mrs. Lincoln’s relationship with Wakeman seemed to grow more intimate in 1865. On January 30, 1865, Mrs. Lincoln wrote Wakeman after he clearly witnessed an argument in the First Family: “It will afford us much pleasure, to have you dine with us, most informally tomorrow evening at as ix o’clock. I name, an earlier hour, than usual, as the President, proposed to me himself, to attend the theatre to see [Edwin] Forrest in ‘Sparticus’ [sic], Mr. [John W.] Forney, whom you perhaps know, may accompany us. I have taken your advice, for I well know, how deeply grieved, the P[resident] feels over any coolness of mine. We have had quite a little laugh together, most fortunately for both my Husband and myself, who [would] have broken our hearts, had it been otherwise, notwithstanding our opposite natures, our lives have been eminently peaceful — The serpents that have crossed our pathways, will be remembered by both of us, with horror, in after years. The communication made you this morning, will I am sure, always be sacredly guarded by you — Asscenes are novelties with us, I felt strangely disposed to tell you. Thank Heaven, the storm has cleared away & I shall ever, even in jest, take especial pains not to provoke discussions, lest forbidden subjects, might be introduced — Excuse so long a note — I shall expect to see you, tomorrow at eleven o’clock.” Mrs. Lincoln also shared with Wakeman her animosity toward Edward McManus, whom she had fired as White House doorman — a job he had held for several decades. Two years after Mr. Lincoln’s death, Mrs. Lincoln took a much harder line with Wakeman. When President Lincoln’s widow sought Wakeman’s help in paying her shopping debts, the patronage appointee was unresponsive. She wrote broker William H. Brady: “Please call and see Hon. Abram Wakeman. He was largely indebted to me for obtaining the lucrative office which he has held for several years, and from which he has amassed a very large fortune. He will assist me in my painful and humiliating situation, scarcely removed from want. He would scarcely hesitate to return, in a small manner, the many favors my husband and myself always showered upon him. Mr. Wakeman many times excited my sympathies in his urgent appeals for office, as well for himself as others. Therefore he will be only too happy to relieve me by purchasing one or more of the articles you will please place before him.”21 By that time, Wakeman had left his government post and returned to the more peaceful practice of law. Abraham Lincoln Papers at the Library of Congress. Transcribed and Annotated by the Lincoln Studies Center, Knox College. Galesburg, Illinois. (Letter from Abram Wakeman to Montgomery Blair, March 25, 1864). Jean H. Baker, Mary Todd Lincoln: A Biographer, p. 234. Thurlow Weed Barnes, editor, Memoir of Thurlow Weed, Volume II, p. 319 (Letter from William H. Seward to Thurlow Weed, January 31, 1861). Jean H. Baker, Mary Todd Lincoln: A Biographer, p. 234-235. Ishbel Ross, The President’s Wife: Mary Todd Lincoln, p. 211-212. Justin G. Turner and Linda Levitt Turner, editor, Mary Todd Lincoln: Her Life and Letters, p. 181 (Letter from Mary Todd Lincoln to Abram Wakeman, October 23, 1864). Justin G. Turner and Linda Levitt Turner, editor, Mary Todd Lincoln: Her Life and Letters, p. 212-213 (Letter from Mary Todd Lincoln to Abram Wakefield, April 4,1865). Justin G. Turner and Linda Levitt Turner, editor, Mary Todd Lincoln: Her Life and Letters, p. 220 (Letter from Mary Todd Lincoln to Abram Wakefield, April 13, 1865). Justin G. Turner and Linda Levitt Turner, editor, Mary Todd Lincoln: Her Life and Letters, p. 435 (Letter from Mary Todd Lincoln to William H. Brady, September 14, 1867).